“As we see customers migrate from cars to SUVs, we'll build on it,” says Ford of Canada President Mark Buzzell. 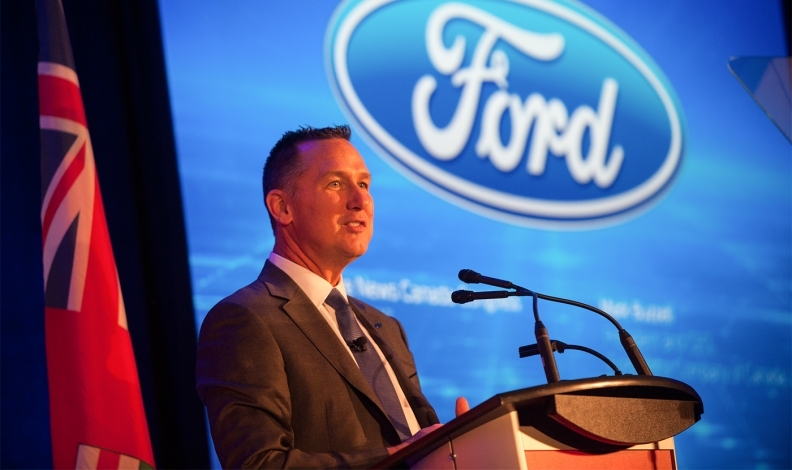 TORONTO -- New Ford of Canada President Mark Buzzell detailed one of his top priorities Friday in Toronto. “We’re really seeing a quick migration from cars to SUVs. It’s part of my responsibility to get our fair share – or more than our fair share – of the market,” Buzzell said at the sold out Automotive News Canada Congress in Toronto on Friday. It marked the first time Buzzell got to speak with a large group of auto execs and insiders since he was named to his post in November 2016. “As we see customers migrate from cars to SUVs, we’ll build on it,” Buzzell said. The automaker already has the best-selling lineup of utility vehicles in Canada. People are fleeing from cars at an increasing rate. Ford’s January car sales dropped 14 per cent over the same month in 2016. Sales of the company’s utility vehicles made significant gains in January in Canada, with an increase in sales of the Ford Explorer, Ford Expedition and Ford Flex, up 57, 79 and 48 per cent, respectively. Meanwhile, the compact utility vehicle has overtaken the compact car as the largest segment in the Canadian market, accounting for about 22 per cent of total industry volume, according to J.D. Power Canada. The compact car makes up about 17 per cent. Ford is about to enter that compact utility vehicle segment with the EcoSport, which goes on sale in early 2018. It will be the automaker’s smallest available utility vehicle. “It’s the right time for EcoSport in Canada,” Buzzell said. Buzzell also sees “a lot of opportunity with Lincoln” in Canada. Lincoln sales have been up three consecutive years in Canada. He hinted that Lincoln service pick up and delivery, which is available in the United States, is a possibility for dealers in Canada. Ford of Canada as a whole is coming off its best sales year since 1989, which, coincidentally, is the year Buzzell started with the company. The automaker sold 1.98 million vehicles in Canada in 2016. It’s Ford F-Series pickup has been Canada’s top-selling truck for 51 consecutive years and has been the best-selling vehicle in Canada seven years running. Buzzell officially started Jan. 1, 2017 and makes Oakville, Ont., his home. He replaced Diane Craig, who was appointed U.S. director of sales for Ford Motor Co., also effective Jan. 1, 2017.